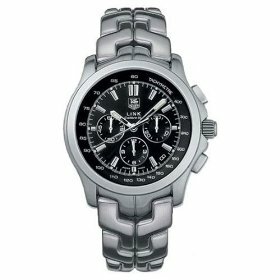 The CT511A.BA0564 TAG Heuer Link Calibre 36 Automatic Chronograph Men’s Watch is an extravegant and durable watch that oozes collection-worthy sophistocation. The TAG Heuer Link Calibre 36 Automatic Chronograph is a watch of mechanical mastery. It boasts a Calibre 36 chronometer-certified automatic movement, which allows it to be one of the few mechanical chronograph movements that can measure short time intervals to 1/10th of a second. This kind of performance is achieved through a balance wheel that vibrates at the extraordinarily high frequency of 36,000 impulses an hour. The chronograph functions are located in the three subdials found on the dial: seconds at 3 o’clock, minutes at 9 o’clock, and hours at 6 o’clock. Nestled between the 4 and 5 o’clock positions is a date function. The dial also features a tachometer scale on the flange, as well as hand applied faceted steel indexes and luminescent hour-markers and hands. The Link Calibre 36 Automatic Chronograph features a brushed stainless steel case and “s” link bracelet. The crystal is a curved scratch resistant sapphire that has anti-reflective treatment on both sides. Its case is cut from a block of solid steel and has a sapphire crystal case back. The dial comes with two color options: black or silver. It is also suitable for diving, as it’s water resistent up to 200 meters.